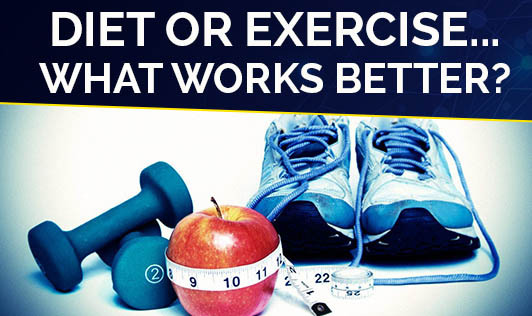 Diet or Exercise... What works better? What is the perfect mantra for weight loss? Eating less and running more? Or just eating less? Or just running those extra 10 minutes after eating a fried chicken? Actually none of the above! A person needs energy to work, just like a car needs petrol to run. Every person requires different amount of energy depending on his/her metabolic rate and the physical activity levels. We get energy from carbohydrates, proteins and fats, all of which is required for smooth functioning of the body. The proportion of these 3 components should be just right. But, don't waste your time in thinking how many calories should you consume for dinner tonight! Your Dietitian will do that for you. Think what happens when you start your car after a very long gap. If you don't exercise regularly, your body will react in a similar way. What you eat, needs to be utilized. Since our jobs are desk jobs, the number of calories consumed is far more than the calories burnt. If you drive your car too fast, the economy will go down. So not exercising or exercising very less or over exerting yourself...is not going to work. You need to know how to balance it out. Go to a fitness expert and get the prescription! Diet and exercise are interdependent. None can work alone. A perfect combination of both works wonders! To get this perfect combination; consult the experts... do it the right way!